Are you looking for an easy way to upgrade the look and feel of your home? For a style you’ll be proud of for many years to come, shop with us for your new luxury vinyl flooring in Cocoa, FL. At our local showroom, we carry a wide variety of products from some of the top brands in the industry today. Whether you are ready to enhance your kitchen, bathroom, or bedroom, you are sure to find something you love when you shop with us. Our inventory includes a range of options that fit in any room in a home. Speak with our team today to learn how a resilient flooring installation can make your space stand out for all of the right reasons. Do you dream of creating a new look throughout every room of your home? With the selection of vinyl laminate flooring at our showroom, you will achieve the style you’ve always wanted for spaces of all sizes. Our inventory includes endless options that are on trend and built to last. With all of the things you have to do each day, taking care of your floors should not be a permanent fixture on your list of chores. However, regular upkeep is often necessary to keep your flooring looking beautiful. Over time, it is only natural that floors will start to deteriorate. In homes with pets, children, or other active components, it is likely that you will require maintenance on a regular basis to keep your floors looking great. Fortunately, there is an easy solution for those looking for strength and style. Invest in a durable option when you visit our showroom for your luxury vinyl flooring. From tile to plank, we carry a number of options. No matter what style you prefer for your home, you can count on our team to deliver a top quality product that fits every preference. Our showroom features endless options in resilient flooring that stand up to regular use without developing chips, cracks, and other types of damage. 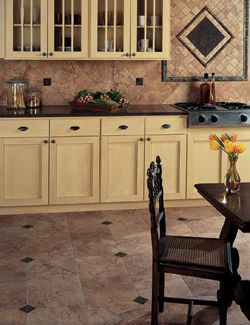 Whether you love the look of natural stone or hard, you are sure to find the design you love at our showroom. Our collection of flooring includes options that mimic the look and feel of a number of classic materials. When you are ready for a change in your home, choosing to update your flooring is an easy and affordable way to enhance your atmosphere without going through a lengthy remodeling project. With the wholesale and discount options from our showroom, you will find everything you need to bring your design ideas to life. Our inventory includes a wide variety of LVT products to fit every preference. Why choose vinyl laminate flooring? From bedrooms to bathrooms, this material makes any room in a home stand out. With styles that mimic the look of hardwood, ceramic, or stone, you are sure to find an option that you love when you shop with us. Our staff of friendly and knowledgeable sales professionals is happy to meet with you to discuss each of our products. When you meet with us, we take the time to understand your wants, needs and taste preferences. We help you shop with confidence for your new vinyl wood flooring for every part of a home. Don’t let your budget keep you from enjoying the home of your dreams. At our showroom, we carry an extensive collection of materials that add style to any room without causing you to go over budget. Our inventory includes options from top names at competitive prices. No matter what your personal style preferences are, you will find the right product to add a touch of class to every room. Homeowners dream of adding the classic look of hardwood to their spaces. However, if this material does not fit in your budget, there is another option for you. Luxury vinyl plank offers the look you want at a price you can afford. It is known to mimic a number of different wood species, complete with various grain patterns, whorls, and finishes. While hardwood installation is a popular option for many homeowners, it is not always the right option for every room. By choosing to install vinyl wood flooring, you will create a stunning look that lasts in any part of a home, including basements, bathrooms, and other moisture-prone areas. Once you have decided on the perfect luxury vinyl flooring for your home, choose from our list of Preferred Installers to complete your installation. Our experienced contractors prepare estimates with a minimum of a one-year installation warranty (written on the estimate). No matter how large or small your rooms are, you can count on our team to install any of our products in spaces of any size. The installers on our list focus on the details to ensure that your new flooring setup looks great and stays functional for years to come. Contact us to enhance the look of your home with our collection of luxury vinyl flooring. Our showroom features options for customers throughout Port St. John, Titusville, Rockledge, Merritt Island, and Cocoa, Florida.